From the swamps to the big leagues: The year was 1989, the Alabama air was thick and the flies were the size of fists. On the edge of the swamps stood a man named Zane Smith, fan boat tour owner and champion gator wrestler. He was a local legend who made toothless women swoon and Klan members bow in his presence. His snaggletooth grill was the standard "look" in his town and was emulated by dozens of men and boys. But "Main Zane" had a hole in his soul that no 8-foot reptile or heaping pile of grits could fill. He pined for something more, something that could catapult him onto the national stage so he could promote his "Frantic Fan Boat Rides." "Main Zane" threw on his bib overalls, sleeveless flannel shirt and trucker hat and started balling up his already-chewed tobacco and heaving it toward a wall on his floating mobile home as a way to deal with his frustrations. In a chance encounter, a French-Canadian scout from Montreal was visiting the Cajun swamp trash part of his family and saw a sweaty, shirtless, snaggletoothed Smith rocketing soggy tobacco balls at his bedroom window. 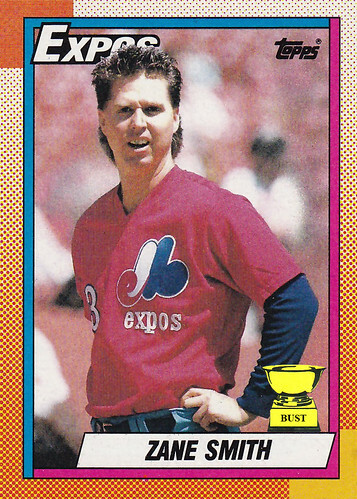 After a promise of front-row Lynyrd Skynyrd tickets, "Main Zane" was in Quebec throwing baseballs instead of chewing tobacco, mullet and all.